The anisotropy of magnetic susceptibility has been proven to be an excellent indicator for mineral fabrics and therefore deformation in a rock or sediment. Low-field anisotropy is relatively rapid to measure so that a sufficient number of samples can be measured to obtain a good statistical representation of the magnetic fabric. The physical properties of individual minerals that contribute to the observed magnetic fabric include bulk susceptibility and intrinsic anisotropy of the mineral phase, its volume concentration, and its degree of alignment. Several techniques have been developed to separate magnetic subfabrics arising from magnetization types, i.e., ferrimagnetism, antiferromagnetism, paramagnetism, and diamagnetism. Susceptibility anisotropy can be measured in low or high fields and at different temperatures in order to isolate a particular subfabric. Measuring the anisotropy of a remanent magnetization can also isolate ferrimagnetic fabrics. 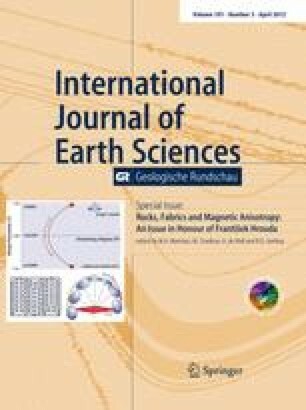 A series of case studies are presented that exemplify the value of isolating magnetic subfabrics in a geological context. It is particularly useful in rocks that carry a paramagnetic and diamagnetic subfabric of similar magnitude, such that they negate one another. Further examples are provided for purely paramagnetic subfabrics and cases where a ferrimagnetic subfabric is also identified. We thank E. Férre, F. Martín-Hernández and M. Chadima for their helpful reviews. The work was supported by the Swiss National Science Foundation, project 2-77070-07.